Sacred Sanctuary is a guided journey into the deep inner resources of our consciousness. It provides you with the opportunity to take a break from the challenges of day-to-day existence and seek refuge in a quiet and expansive state of being. We refer to the inner voice or the inner Being as the teacher. It is the part of us that�s guiding us in each moment back into harmony and back into peace. Every journey is to find the Sacred Sanctuary within you, to find the Divine, to find Source. The journey is always different. The destination, when we get there, is always the same. His students call him "Sensi" (Japanese "Teacher"). 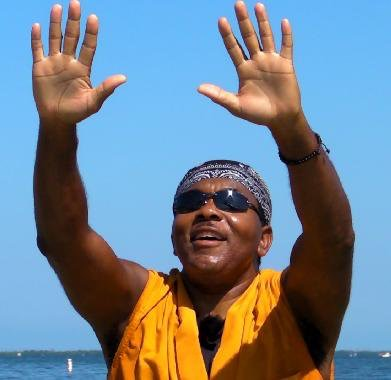 Charles Robinson is a teacher, a guide, and the creator of Kai Chi Do. The inspiration for Kai Chi Do came to him while he was leading a meditation group back in the early 1970�s. Yes � he was teaching meditation in the 1970�s. But Charles wasn�t a hippie. In fact, he never has fit neatly into any category. Charles was raised as a Catholic altar boy, took Buddhist vows, married a Jewish Unitarian, and named their daughter a Hindu prayer. He studied martial arts, but developed Kai Chi Do as a non-martial art. Charles hangs with suits but he dresses in a gi. Charles is a Licensed Mental Health Counselor, and earned a Bachelor�s degree in psychology and a Master�s degree in Education from Seton Hall University. His purpose, in every aspect of his life and work, is to help people recover their connection to Source, self and others. He helps people to move forward by meeting them exactly where they are. Charles� wife, Susan, is his one-person administrative team, so if you follow their events or sign up for any of their services, you�re sure to bump into her juggling details. Susan is also a great role model for doing Kai Chi Do at your own pace. IMPORTANT: Flowering Heart Center is in a residential neighborhood. behind the office building on Drew Street.